Luckily, they’re not very big, only the size of a dime. I tried using our CNC mill to machine one but it quickly became apparent that it was going to take too much time like that since it would have to be machined from two sides and with a good finish. I decided to turn to one of my favorite techniques- casting the parts. Other people have written very extensively about casting techniques, my favorite is at http://lcamtuf.coredump.cx/guerrilla_cnc1.shtml . For the time impaired, the basic idea is that you make a mold of the part that you would like to make and fill it with a two-part resin to make the finished product. 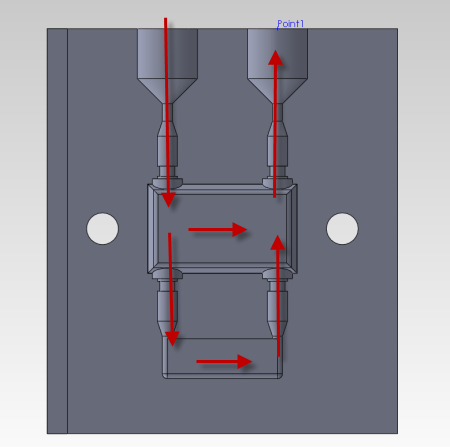 The mold can either be a soft silicone, as the site above shows, or a hard mold that you machine directly in a CNC mill. For small parts like this one I like to save a step and directly machine a hard mold. Since I only need to make 50 pieces, I decided to machine them from Delrin- a very strong plastic that happens to be relatively non-stick. The non-stick part ends up being a huge benefit here to make it easier to remove the finished parts. 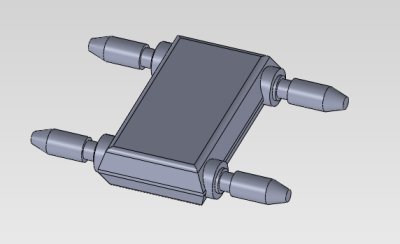 The fist step was to reopen my part in SolidWorks and design a mold to produce the parts. 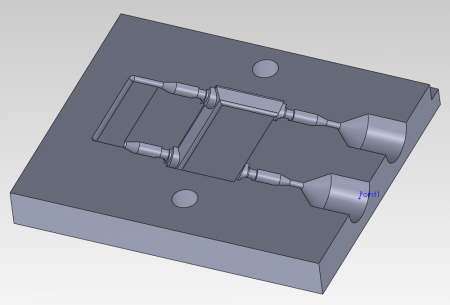 Since the part is symmetrical, I only need to make half of the mold and machine them in multiples of two. The resin is pushed in from the left and eventually overflows out through to the right, hopefully taking most of the air with it. Any air left in the mold will create a void in the finished part. 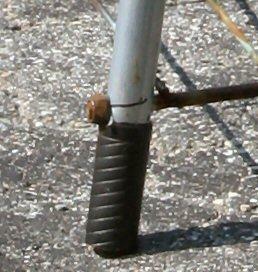 Note that without the bottom-most runner, there would be no way to get resin into the bottom legs of the part since air would be trapped in there. There are certainly better ways to approach this part but this was easy and I was in a hurry to get started. "Here, the rescued charcoal grill once again stands tall, thanks to its newly donated and professionally fitted prosthetic leg. The grill appears fully ready and even eager for handling yet another full summer of seriously grilling many more delicious meals." 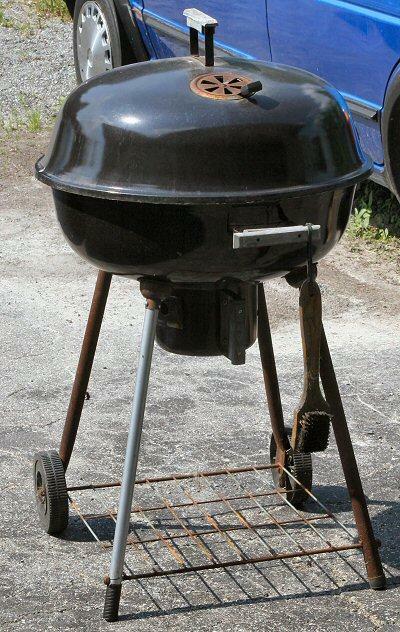 While pictures of the heroic rescue and salvage operation were unfortunately unavailable for publication, DP reporters were able to obtain exclusive images of the miraculously salvaged charcoal grill, which appears ready to stand tall through yet another summer of heavy cooking use and abuse thanks to its custom new prosthetic leg, shown below. This leg used to be a mop handle, and was made available by the tired old mop, which had selflessly signed a permission slip authorizing medical authorities to use any such body parts as may be of use to help others when it passed away. It died peacefully of old age in its sleep just as the need to use the grill arose, and so authorities wasted no time in putting together this rescue/salvage operation. Both a 4×6 metal cutting bandsaw and an X2 mini-mill volunteered their services for this emergency grill rescue, although the X2 mini-mill humbly downplayed its part in this miraculous salvage operation, referring to itself as only being used as just a “precision drill press” in the resuscitation efforts. The 4×6 bandsaw offered no comment, preferring to stand quietly in its corner of the garage, out of all the hubbub and excitement, just waiting to cut something, anything, hopefully soon. The 4×6 bandsaw cut the metal tubing mop handle to length, and the rubber handle end was cut down just a bit to remove the hole in the end that was previously used to hang the mop up on a hook on the wall. This was deemed to be too structurally weak for grill leg duty and so was simply removed, leaving the remaining rubber handle to act as a foot. The grill’s owners were unavailable for comment, with a family spokesman only commenting that the grill had already BBQ’d up 5 delicious steaks and a full pack of hot dogs, and the family was presently engaged in enjoying their Memorial Day meal. Further investigation by this reporter revealed that it is common for grills of this type to rust away and weaken at the spot near the base of their legs where they are drilled through for the bottom grill rack to mount into. What eventually happens is this spot rusts, weakens, and finally the bottom of the leg breaks off. 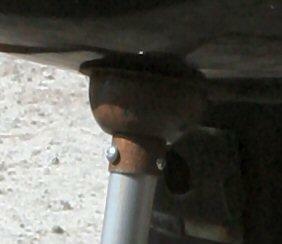 This makes the grill become prone to falling over and unsafe for further use. Often such afflicted grills are retired and salvaged out to metal recycling plants. Thanks to the selfless gift of life from the now dearly departed old mop, and of course the tireless and skilled efforts of the 4×6 bandsaw and X2 mini-mill, there is at least one charcoal grill that is not going to go out that way just quite yet. Lots of life to live and grilling to give left in this old beast, for at least another long hot summer, maybe two. DP – Disassociated Press. All Rights Reserved. This is the bracket I made last weekend so I can tow my ancient hand-pulled lawn roller behind my riding lawn mower. I usually don’t roll my lawn because the soil has so much clay it strongly resembles concrete when it dries out in July, but parts of it really needed it. I know it’s not a very interesting project but I had fun making it, it gave me a chance to practice welding and I also got some more CAD/CAM experience out of it even though it never got near my CNC mill. Then I simulated running the G-code D2NC created on my office copy of Mach3, the software that controls my mill. That’s when I had my Homer moment and realized the part was too big for the mini-mill’s Y-axis. It was also a little too big to cut properly with my 4×6 bandsaw. But by tipping the metal in the vise I was able to cut all but a few inches, which I finished with a hacksaw. The metal came from a very over-sized piece of ¼-inch thick steel that was under a support post in my basement. I’d cut a piece off it the night before to make room along a wall for a heavy-duty shelving unit that’s going to be part of my new “winter” workshop. That task was made much easier and safer by the $8 Harbor Freight Safety Guard (#61680) that I purchased because I thought it might come in handy someday. It fits on a 4 or 4-1/2-inch angle grinder to protect you while using a cut-off disc or diamond saw. It kind of turns your angle grinder into a small circular saw. 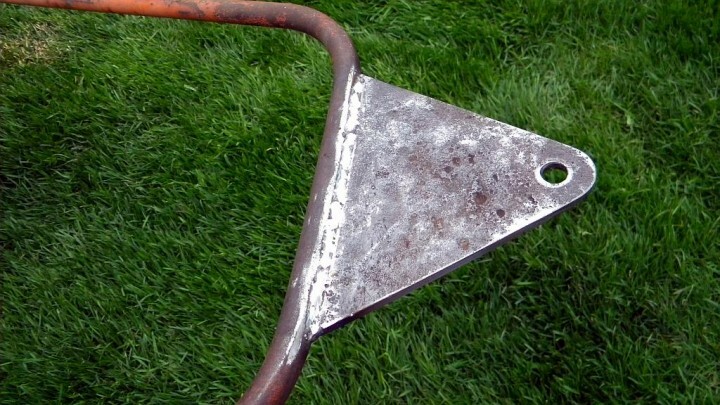 It’s not a great design but it did allow me to make a nice straight cut by pushing the grinder along a heavy steel bar I used as a straight edge. It also allows you to control the depth of the cut. Which is more useful with a diamond saw than with a cut-off disc that is constantly getting smaller as it wears down. The time to win a fight is before it starts.